Reishi mushroom is one of the oldest mushrooms known to be used medicinally by humans. It is highly prized as a major tonic in Chinese herbalism, ranking close to ginseng for its broad spectrum of health benefits. Often referred to as "the mushroom of immortality", it has been valued as a longevity herb in Asian cultures for well over 2,000 years. 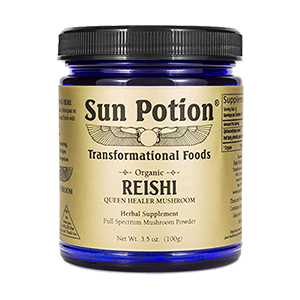 Also called "the great protector" due to its qualities as an adaptogen, reishi helps to guard against the impact that physical, immunological and mental stress can have on the body over time. 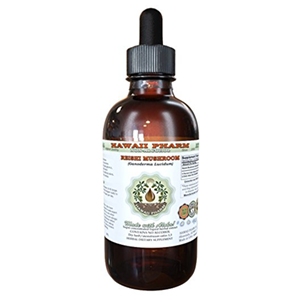 When taken on a consistent basis, it assists in modulating immune response with effects that calm and protect the central nervous system as well as support liver and cardiovascular functions. The mycelium additionally contains many other different constituents including peptides, nucleotides and other elements common to medicinal mushrooms like mannitol, coumarin and various alkaloids, all of which add to the mushrooms properties as an immunomodulator and anti-inflammatory agent. Typically consumed as a tea, powdered hot water extract or used as a tinctured alcohol solution, preparations commonly use the fruiting body of the mushroom. However, more modern-day high quality versions usually always include reishi spores, newly identified for their higher amount of triterpenoid content. According to herbalist Ron Teeguarden, it is a commonly prescribed treatment in Japan for chronic bronchitis, memory loss, insomnia, hyperlipidemia and a whole range of age-related degenerative diseases, including dementia. 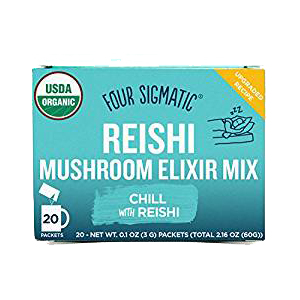 Evidence documented in a 2013 study suggested that an extract of reishi mushroom inhibited the inflammatory mediator response by suppressing certain signaling pathways and "may be potentially useful in the treatment of neurodegenerative diseases." What is Ganoderma lucidum or Reishi? Ganoderma lucidum is a polypore mushroom that is native to woodland regions of China but now grows in forests as far north as Canada. Some species are also found in the Amazon and even parts of Africa where humid conditions persist. Reishi grows wild on decaying wood or at the base of trees (particularly maple), but is not as prolific as other mushroom varieties like turkey tail or chaga. 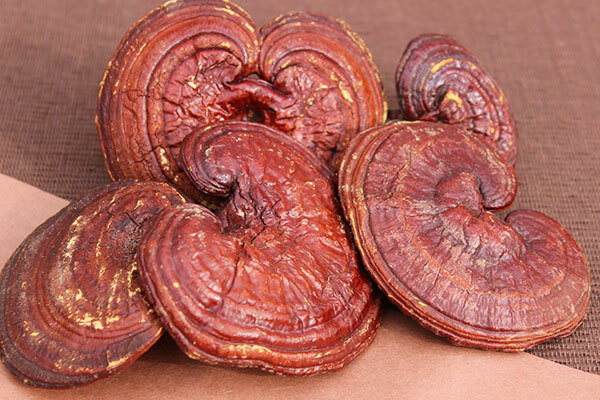 Red reishi mushroom, or Ganoderma lucidum, is the most common type used for medicinal purposes and is now widely cultivated on logs or wood chip cakes in Asian countries. There are also six other species of reishi in the genus Ganoderma, commonly differentiated by their color and benefits to different organ systems. These types include the more common black reishi or Ganoderma sinensis, in addition to white, yellow, green and the rare purple reishi variety. 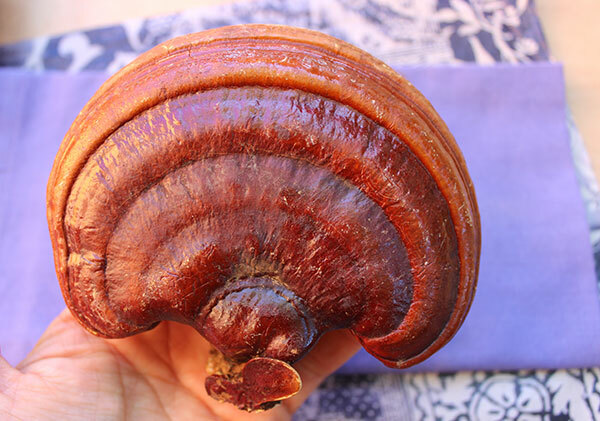 Unlike other mushrooms, reishi typically has an unusual woody, cork-like texture and a unique glossy varnished-looking appearance. Ganoderma lucidum is derived from the Greek words gano and derma, which translates "sheen skin" and the Latin word lucidum which means "shining." The fruiting body or cap is rounded on one side with a kidney-type shape, a lighter colored edging and a patchy white to light brown underside. Also called lingzhi in Chinese, reishi was historically used in China, Japan, Korea and other Asian countries for promoting health and encouraging a "long life." Li Ching-Yuen, the legendary longest living man believed to have lived to the age of 252, was claimed to have consumed daily tonic brews and tinctures consisting of reishi as well as ginseng, fo-ti root, gotu kola and goji berries. According to the historic Chinese herbal classic, the Shennong Ben Cao Jing, "Long term consumption [of reishi mushroom] will lighten the body and prevent aging, extend one's life, and make one an immortal." In the first volume of Shennong's Materia Medica, reishi is listed next to other top tonics such as ginseng and eucommia bark. 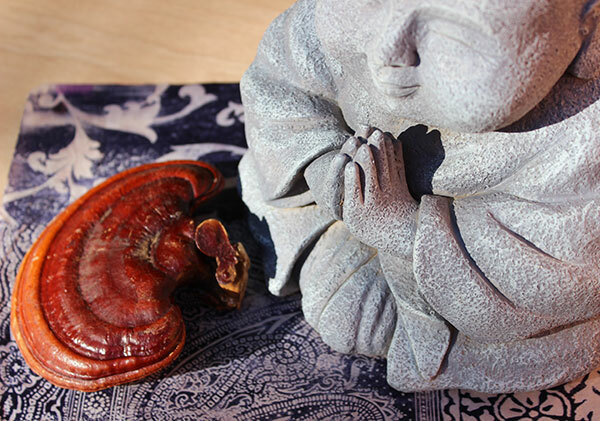 Held in high regard by ancient Taoist masters, reishi is one of the chief Shen tonics known for its ability to induce meditative states and encourage spiritual awareness. Once reserved for emperors and the ruling elite, the reishi mushroom was often found embroidered on imperial clothing, carved into stone and architecture, incorporated in legendary folk stories and painted into famous artwork. 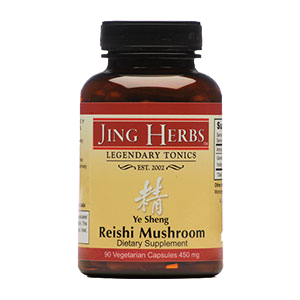 In Traditional Chinese Medicine, reishi is valued as premiere Chi (Qi) and Shen major tonic herb, but also strengthens Jing. It is beneficial to the heart, liver, lung and kidney organ systems. Containing beta-glucan polysaccharides, reishi mushroom is an adaptogen that works to adjust and fine tune the immune system, beneficial for restoring healthy immune functions. Lingzhi is often referred to as an "immune modulating" tonic, which means that it can work to regulate immune response whether deficient or excessive depending on what is most appropriate for each unique individual situation. 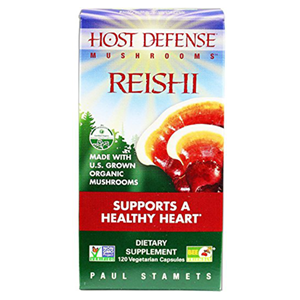 It is our personal belief that, in this day and age, it is important to keep our immune systems strong by fortifying it on a regular basis with adaptogens like reishi. 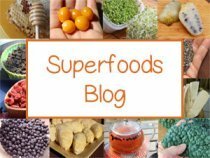 This is a preventative approach to sickness and disease that can also help to protect us from various autoimmune conditions, which are becoming increasing more prevalent in today's modern world. 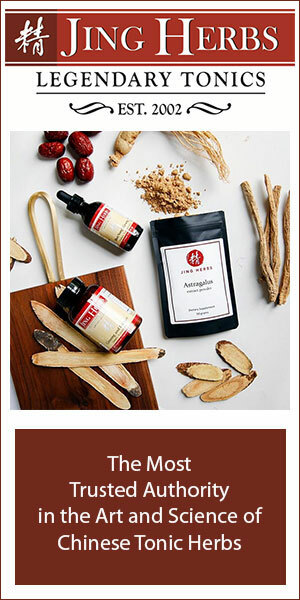 Like other adaptogens, lingzhi offers a protective element that helps one make necessary adjustments needed to deal with change and life challenges, decreasing cellular sensitivity to certain stress factors. Consuming reishi teas or extracts on a regular basis is subsequently known to reduce the effects that daily stress and anxiety can have on the body over time. 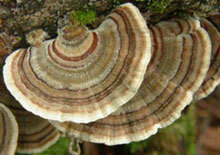 Ganoderma lucidum contains a group of antioxidant triterpenes called ganoderic acid. Ganoderic acid is known in Chinese herbalism to protect and support the functions of the liver. 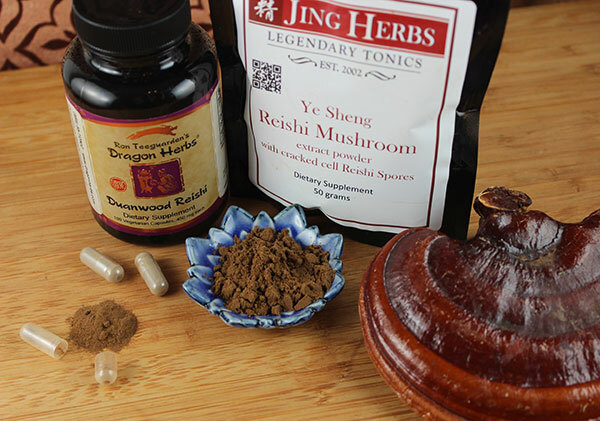 The Chinese word for reishi, lingzhi, means “herb of spiritual potency.” Although it is tonifying to all "three treasures" (Jing, Qi and Shen), it is considered a particularly potent "Shen" tonic. Working with the heart and kidney organ systems, it helps to calm the nerves and promotes a clear and peaceful state of mind. Encouraging a meditative state, helpful in developing spiritual awareness, it has been used throughout history by Taoist monks and spiritual seekers to sharpen concentration skills, build will power and expand inner consciousness. 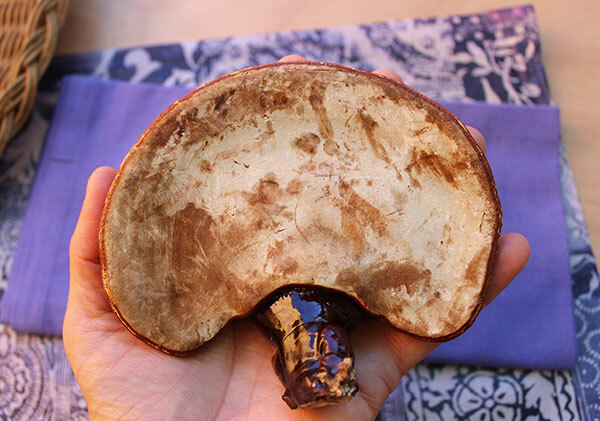 It is important to note that "wild" reishi mushrooms are particularly famed for their higher Shen-like qualities. Consistent use of decocted teas, extracts or spore concentrates is considered to be one of the top Chinese remedies for those who suffer from insomnia. This is most likely due to its adaptogenic effects that can work to simultaneously sooth the nervous system. Although reishi is valued for its ability to help one achieve restful sleep, but is not considered to be sedative in nature. 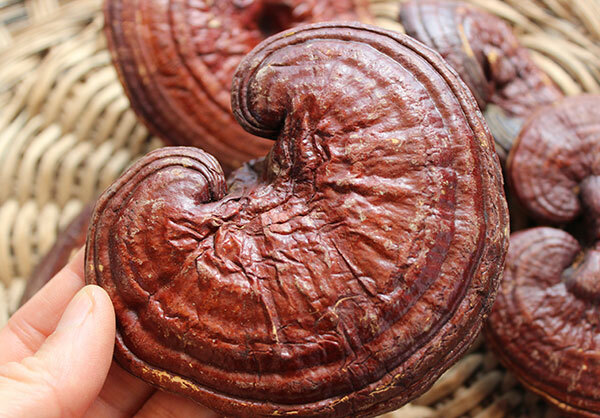 The energetic attributes of red reishi are specific for the heart organ system and believed to "open and calm the heart" as well as boost heart Chi (Qi) in Traditional Chinese Medicine. What are Reishi Mushroom Spores? At the end of the reishi mushroom's growing season it releases millions of "spores", or very small microscopic seeds, which coat the fruiting body and naturally spread to surrounding habitats to generate more mushrooms. These spores are known to be extremely rich in triterpenes and can be collected as a powder which is cell wall cracked to make them medicinally absorbable to humans. 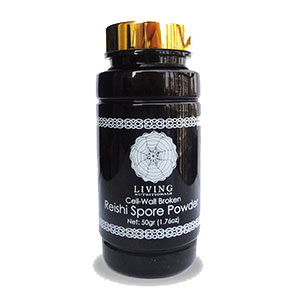 The spores also contain an oil which is commonly extracted for its triterpene concentrations. In addition, triterpene crystals, the most condensed form of triterpenes created from the spores, are also available through high-tech extraction methods. 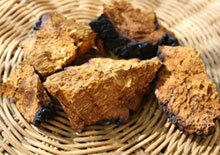 Recent scientific attention has been given to Ganoderma lucidum spores because of their proven high triterpene content. According to North American Journal of Medical Sciences "the triterpenoids were found to be the most important active substances for its [reishi's] numerous pharmacological uses." In this same review it states that "Triterpenoids isolated from ganoderma spores showed significant anti-HIV-1 protease, antitumor, and anti-complement activities." With the help of modern science, extracts are now available in the form of reishi spore oil, reishi spore powder and reishi spore triterpene crystals. They are definitely one of the most powerful ways to consume reishi for those who would like to take super concentrated doses. However, we also recommended simultaneously consuming the teas or powdered hot water extracts of the reishi fruiting body for the highest health benefits. Whole Dried Mushrooms, Slices, Pieces or Powders - This is the dried mushroom fruiting body that should be simmered in hot water for 20 minutes or longer, strained and consumed as a tea. Powdered Hot Water Extracts - These are concentrated liquid tea solutions that have been spray dried to produce a powder. 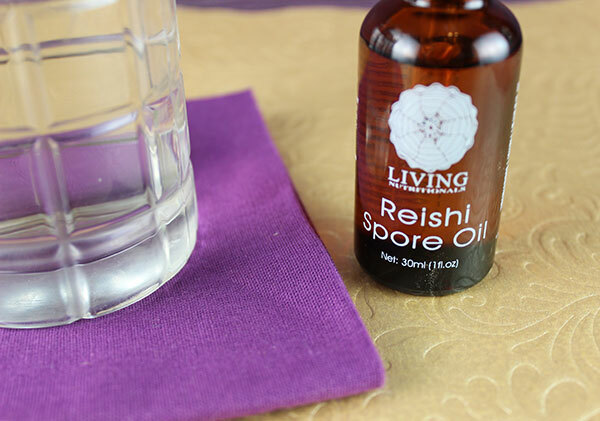 Reishi Spore Oil - This is a golden oil extracted directly from the cracked-cell spores (seeds) of the mushroom. The best quality is pure spore oil with no fillers or other additives. Comes in liquid or capsule form. 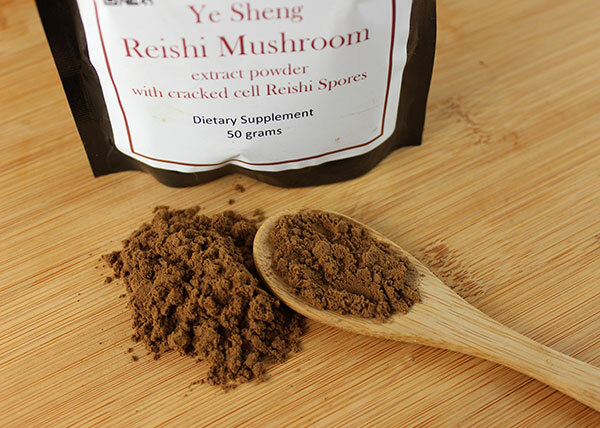 Reishi Spore Powder - This reishi powder is created by cracking the cells of the reishi spores to make them digestible and appropriately utilized. Reishi Triterpene Crystals - These are the pure triterpene crystals concentrated via high-tech reishi spore extraction methods. 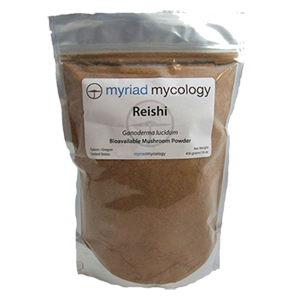 Reishi Mycelium Biomass - This is a condensed powder produced from the white mycelium biomass before it forms the fruiting body. This is mostly a Western technique not commonly employed in Asian countries. 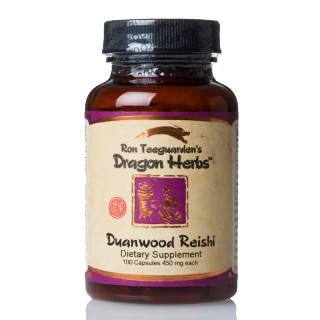 Dragon Herbs Duanwood Reishi - This is an encapsulated powdered hot water extract. 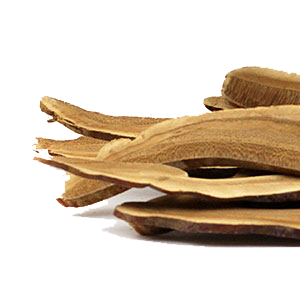 Duanwood reishi is a type of red reishi cultivated for commercial use but is of a significantly higher quality, grown on certain types of hardwoods indigenous to specific regions of China. 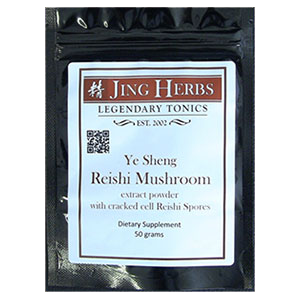 Jing Herbs Reishi Powdered Extract/w Cell-cracked Spores - Comes as a loose powder in 50g or 250g sizes and is a combination hot water extract along with the mushroom spores. 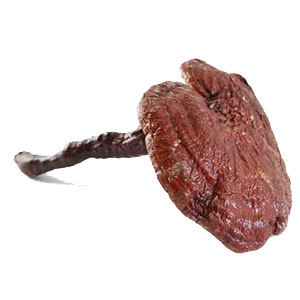 It is derived from wildcrafted or "ye sheng", reishi as opposed to cultivated. 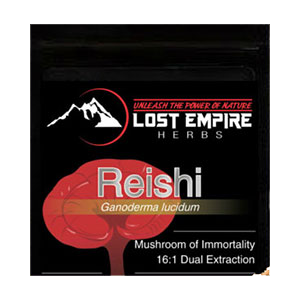 Lost Empire Herbs Powdered Extract - This is a four powdered blend of red, purple, black and white reishi mushrooms to provide a broader range of benefits. 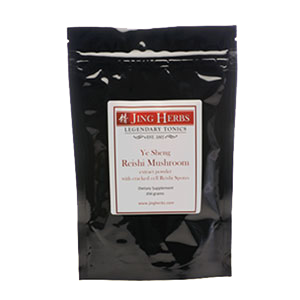 Mountain Rose Herbs, Dried Reishi and Extract - Organically certified dried whole red reishi mushroom and slices. They also offer a liquid extract, which is a double extraction of the fruiting body using a combination of both hot water and alcohol solutions. 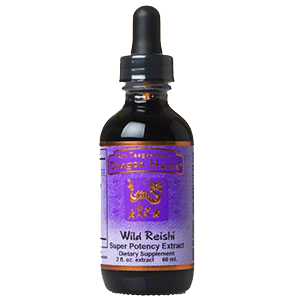 Dragon Herbs Wild Reishi Drops - This product is made from wild Changbai Mountain red reishi fruiting body using a double hot water alcohol extraction method. Mushroom Science - This is a powdered hot water extraction, standardized to provide 4% triterpenes and 12% beta-glucan polysaccharides. 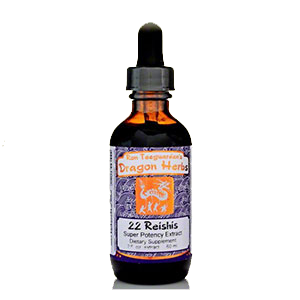 Dragon Herbs Reishi Spore Oil - Softgel capsules (500mg) of reishi spore oil, contains over 150 mg of triterpenes. Living Nutritionals Reishi Spore Oil, Powder and Triterpene Crystals - These are very high quality cell-wall broken spore derived products, some of the best on the market and one of the only brands that sell the triterpene crystals. 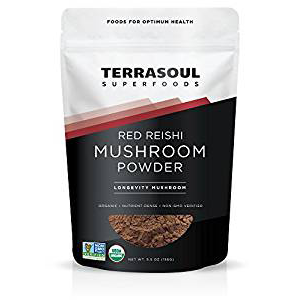 Fungi Perfecti Reishi Mycelium Biomass - A reputable top-notch medicinal mushroom brand that uses activated, freeze-dried, certified organic mycelium powder in capsule form. Reishi mushroom, in all its forms, is best and most effective when consumed on a regular basis. Small doses taken throughout the day for the long term is better than high doses taken only for short periods of time. Medicinal mushrooms need to be heated in water to break down the outer chitin shell. This releases the polysaccharides that are not otherwise bio-available to our digestive system in their fresh or dried state. Alcohol solutions are also used which work to specifically extract the triterpenes. 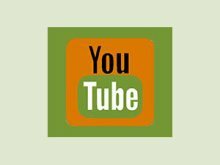 For these reasons double extraction methods, using both hot water and alcohol, are commonly employed. Reishi is a bitter woody tasting mushroom with a slightly sweet flavor. Powdered extracts can be mixed into hot water or teas and sweetened to create a bittersweet coffee-like drink. These powders can also be blended into tonic elixirs, shakes and even desserts, like our chocolate cake recipe. Hot water extracts also come in capsule form for convenience. Spore powders, reishi spore oil and triterpene crystals can likewise be integrated into drinks or mixed with water. Follow the recommended dosage amount on the reishi product, usually most will give average to high dosage amounts which can be followed accordingly depending on your own unique body type and current health issues. Generally between 1/2- 1 1/2 teaspoons (2-6 capsules) of powdered extract is recommended once or twice a day. 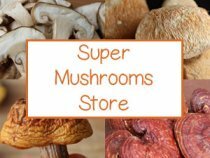 Reishi is one of our personal favorite top 10 superfoods, but for more on other medicinal mushroom varieties see our pages on: lions mane, agaricus, maitake, cordyceps and shiitake in the links below this page. Although medicinal mushrooms, like reishi, are found to be safe to use on a regular basis, we generally recommend that you consult a qualified healthcare practitioner if you are pregnant, nursing, taking prescription medications or have a serious health condition.